59. What is a Bank Trust? 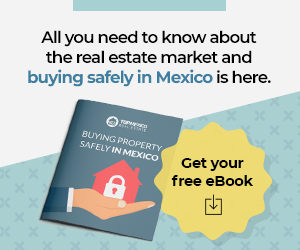 The Mexican Constitution does not allow direct ownership of real estate by Mexican foreigners in what is known as the "restricted zone." The restricted zone includes all land located within 100 kilometers of any Mexican border, and within 50 kilometers of any Mexican coastline. In order to permit foreign investment in these areas, the Mexican government introduced "Fideicomiso," (FEE-DAY-E-CO-ME-SOS), which is, roughly translated, BANK TRUSTS. Essentially, this type of trust is similar to trusts set up in the United States, but a Mexican bank must be designated as the trustee and, as such, has title to the property and is the owner of record. The Bank Trusts has enabled foreigners, as beneficiaries of the trusts, to enjoy unrestricted use of land on the coastlines, in order to realize improvements, expansions, and to profit from the sale of the property without restrictions. 60. Who can provide me with this service? Any Mexican Financial Institution. Today, such institutions include a variety of multinational organizations such as Citibank of Mexico, Scotia Bank of Mexico, HSBC of Mexico, Banorte, Bancomer to a name a few. Please see our Bank's directory for banks in Mexico. 61. What is the cost of the Bank Trust? Bank Trust might be from $700 - 1200 USD. 62. Can I legally own property without a bank trust if I have an FM2? No, the only way a foreigner can own property in Mexico without a bank trust is to become a Mexican citizen or to have a corporation. 63. What can the foreigner beneficiary expect from the Bank Trust Agreement? The trust can also be inherited to your family by naming them as Secondary Beneficiaries in the event of your death. The property can also be sold to a person legally authorized to own land or to another foreigner via a trust. 64. Is the Trust Renewable? The "Fideicomiso" Bank Trust, is set up through a Mexican bank for a period of up to 50 years and can be renewed multiple times for other 50 year periods. To acquire the land the purchaser must obtain a permit from the Ministry of Foreign Affairs. 65. Do I lose possession of property after 50 years have transpired? No. The beneficiary has a contractual right under the trust agreement with the Mexican bank to all benefits that may result from the use or sale of that property. Under Mexican Law, the bank, as trustee, has a fiduciary obligation to respect the rights of the beneficiary. With the expiration of a 50 year bank trust, the same beneficiary has a contractual right to renew the bank trust for another 50 year term. Such renewals can occur on multiple extension requests. 66. What happens to my Fideicomiso if the bank fails? The Fideicomiso will be transferred to another authorized Bank. The Bank does not own the Fideicomiso, you do! 67. How does the Trust function? 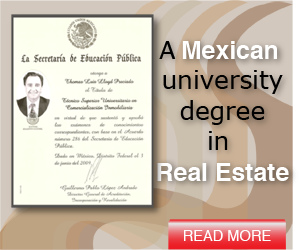 Title of the real estate is transferred to a Bank Trust with a Mexican financial institution acting as Trustee. 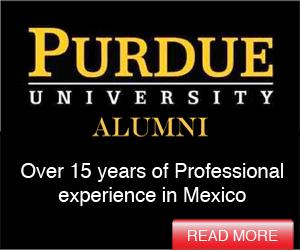 The Trust Agreement is formalized by the issuance of a permit from the Mexican Ministry of Foreign Affairs. The buyer is designated as First Beneficiary in the Trust and the beneficiary rights and transaction are recorded as outlined by Mexican law, in the public record by a Notary Public. 68. How much does the Bank Trust cost? Based local rates, the bank charges the person desiring the Fideicomiso an initial fee of $800 USD for drawing up the agreement and establishing the Trust plus a percentage based on the value of the property. 69. Are there additional fees for the Bank Trust? Yes. Financial Institutions charge an annual fee for Trustee services. This rate is determined on the property value. But normally is between $700 up to $1200 per year. 70. Who is involved in a Bank Trust? In the trust there are three parts: The Trust Settlor (Fideicomitente) which may be a physical or legal Mexican national, who is the owner/seller of the property which is to be placed in trust; the Trustee (Fiduciario) which, by law may only be a government approved financial institution who will hold the raw real estate; and the Beneficiaries (Fideicomisarios) the legal or physical foreign persons who are the FIRST BENEFICIARIES of the trust who obtain the rights for use and benefits of the said property. 71. What is the First Beneficiary in the Bank Trust? First Beneficiaries are also known as "owners". These are the investors that make the decisions. Multiple people can be listed as first beneficiary. If multiple listed First Beneficiaries, all must sign for any future transactions whether selling, transferring, improving etc. 72. What is the Second Beneficiary in the Bank Trust? The Second Beneficiaries are also known as "beneficiaries of the owners". You will need to establish Second Beneficiary for each one of the First Beneficiaries. If one of the First Beneficiaries want to inherit to other of the First Beneficiaries, this needs to be explained too. Certain percentage ownership, or instructions can be instructed, but it is a good idea to keep the document simple. Currently, there are no inheritance taxes. Changing the Second Beneficiary into First Beneficiary status is not considered a sale in Mexican Law therefore no taxes are liable although Bank fees and Notary fees will be incurred.